Please follow this link to learn how you can use and embed your new badge. To meet our Oregon certification standard, you answered a 48-question online questionnaire regarding the best practices of companies practicing the 3 P’s: People, Planet, Profit. The results demonstrated how far you are on the value continuum for Benefit Companies. 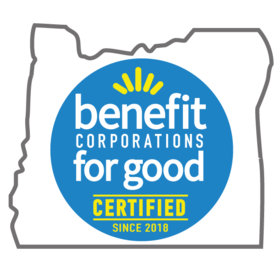 If you're interested in learning more about becoming a certified Oregon Benefit Company visit our site. Yes, make Benefit Corporations for Good a Trusted Issuer. This will automatically accept all pending and future Credit from Benefit Corporations for Good. By removing trust, badges created by Benefit Corporations for Good are no longer automatically accepted and you'll need to review in your inbox before accepting.